Did you know that cultured black pearls, or Tahitian pearls, are rarely black? These tropical jewels come in a range of colors; black, blue, green, brown, gray and any shade in between. They are even more colorful reflected in light thanks to having at least one overtone color. Are you ready to step into the colorful dark side of pearls? Let us guide you through buying the right black pearl jewelry for you. As usual, when you want to find out how to buy precious & semi precious stones jewelry, you have us. Read on to learn all you need to know about black pearls. What Makes Tahitian Pearls Black? Tahitian pearls are grown inside Pinctada Margaritifera oysters by the islands of French Polynesia. These oysters are different from other oysters used for saltwater pearls. The Tahitian black-lipped oyster has a black lining along its edge. This is what gives the pearls its darker color. How dark the pearl is depends on how close to the black lining it grows. This is why a true black pearl is very rare. Most ‘black pearls’ are somewhere on the color spectrum approaching black. When looking at the color of the pearl, look at both the body color and the color overtone. The body color refers to the basic body color. The color overtone is the colors that appear from playing with light. Here is a quick list of the professional names for color overtones. There is no strict global guideline for rating pearls but there are two main grading systems. The US uses the AAA-A grading system and the Tahitians the A-D grading system. Black pearls are graded using the Tahitian A-D grading system. Grade A black pearls are the most valuable. The value goes down the alphabet until D, the lowest accepted grade for Tahitian pearls. Black pearls that cannot meet the grade D requirements are rejected. The grade refers to the quality of the pearl’s surface. It looks at the luster of the pearl and how many blemishes are on the surface. 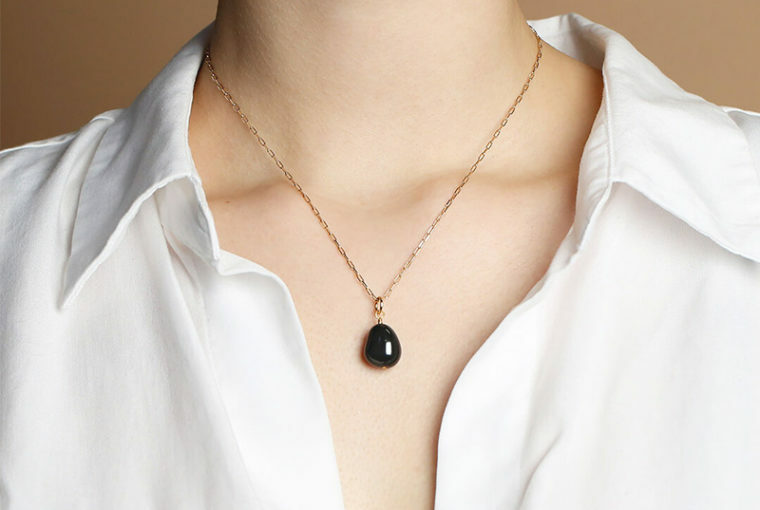 A grade A black pearl has the best luster and less than 10% of its surface has inclusions. As you move down the grades, the percentage of inclusions increases and the luster is less brilliant. 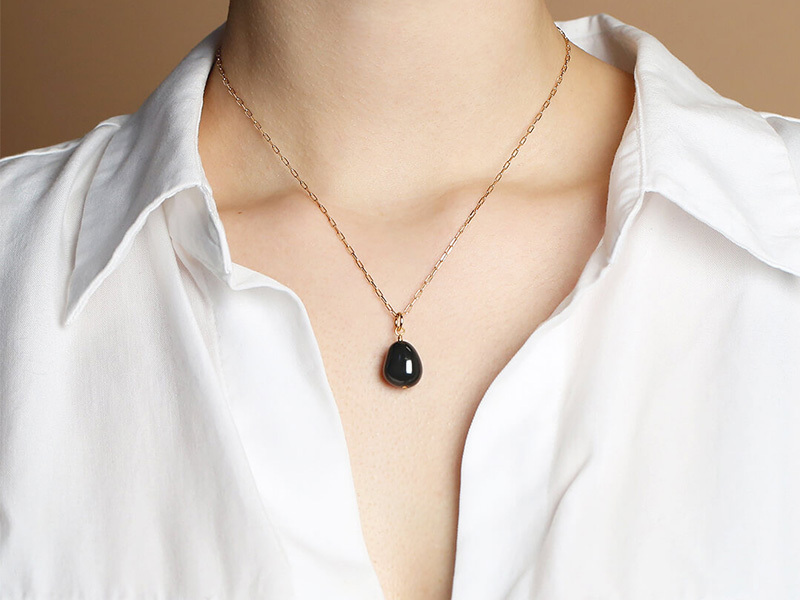 A grade D black pearl has the least luster and inclusions on up to 66% of its surface. Tahitian pearls are the largest naturally cultivated saltwater pearls. Their average diameter is around twelve millimetres. The smallest accepted black pearl size is nine millimetres. A diameter of fourteen millimetres or more is very large and is rare to find. Aside from the total diameter of the pearl, the nacre radius to the nucleus is also measured. The nucleus is the material that the nacre, or the shiny surface, of the pearl grows around. According to the Tahitian grading system, the nacre must be a minimum of 0.8 mm. Less than 0.8 mm is not sold because the pearl is of low quality and wears easily. These dark saltwater pearls can come in any shape. The diameter and axis of rotation is also used in determining the pearl shape. Below is an overview of each shape. A perfectly round pearl is extremely rare. A pearl that has less than 2% variety in its diameter receives the round pearl label. There is a clear axis of rotation. Semi-round pearls: are slightly more varied than round pearls. The diameter is allowed a difference of up to 5% with still a clear axis of rotation. They come in any shape or form. There is no axis of rotation. Semi-baroque pearls have four subcategories, the drop-shaped pearl, pear-shaped pearl, oval pearl and button pearl. Each type needs to have an axis of rotation. This name comes from the many layers of rings around the axis of rotation. Ringed black pearls are more colorful thanks to these ripples. Jewelers like to inlay the rings with metals or gemstones to create more intricate designs. Necklaces and bracelets that are a string of pearls are usually made of round or semi-round pearls. The imperfections are carefully hidden by drilling the hole in a strategic place. Semi-baroque pearls are popular for earrings because it is still easy enough to find two matching pearls. Semi-baroque pearls are also popular as a pendant. Recently, baroque pearls are becoming trendier. Bold shapes are hot in jewelry right now and so are pearls with a modern twist. Baroque black pearls fit this description perfectly. If you enjoyed finding out more about black pearls, continue on this blog. We publish daily articles with lots of high-quality information about jewelry, from buying guides to maintenance tips and, of course, styling advice. If you are in the mood for freshening up your jewelry collection with a new fabulous pearl design, visit Ana Luisa online jewelry shop. Check out our unique pearl jewelry collections and discover fabulous designs that you won’t find elsewhere.